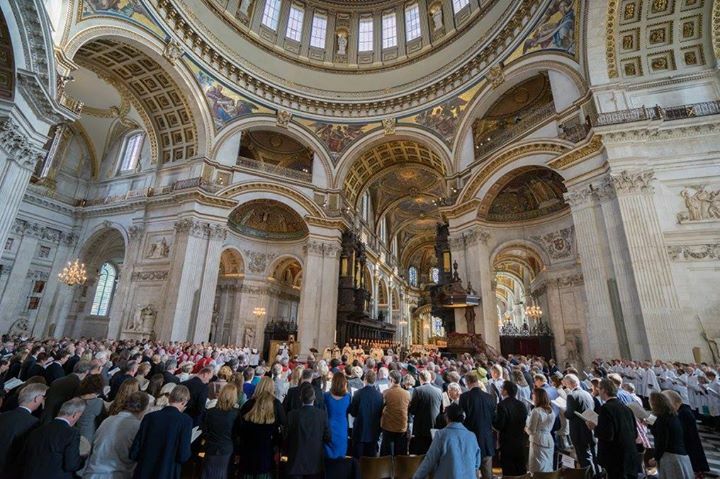 At the end of September I was present in Wren’s spectacular St Paul’s Cathedral for the consecration of two female and one male Bishops. The old Prayer Book calls it The Form of Ordaining or Consecrating a Bishop, but Thomas Cranmer would not have thought it possible, let alone usual, to have both men and women as candidates. Apart from a lone protester (more of him later), everyone present was delighted – especially those of us from Bath and Wells, as one of the candidates was Ruth Worsley, being made Bishop of Taunton. Yours truly (back to camera) with Bishop Peter Hancock and Ruth Worsley awaiting the start of the service. My role as outgoing pro-prolocutor of the House of Clergy meant I got to robe with the Bishops in a side-chapel. I was immediately struck by the huge change that has happened in the last year. In July 2014, I remarked upon a consecration I attended as being the last ‘all-bloke affair’ (read my post here). That has all changed. 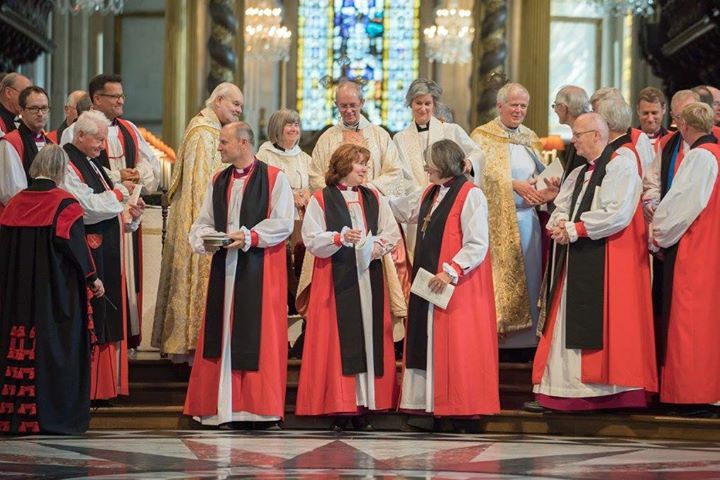 In the slightly chaotic assembly of suitcases, orders of service, coat-hangers and episcopal robes were a smattering of new women Bishops – Ali White from Hull, Sarah Mulally from Crediton, and Rachel Treweek from Gloucester. And, as someone said: “it looks quite normal”. Maybe we have now actually reached the point where, instead of worriting about “women Bishops” we can just talk about “Bishops”. 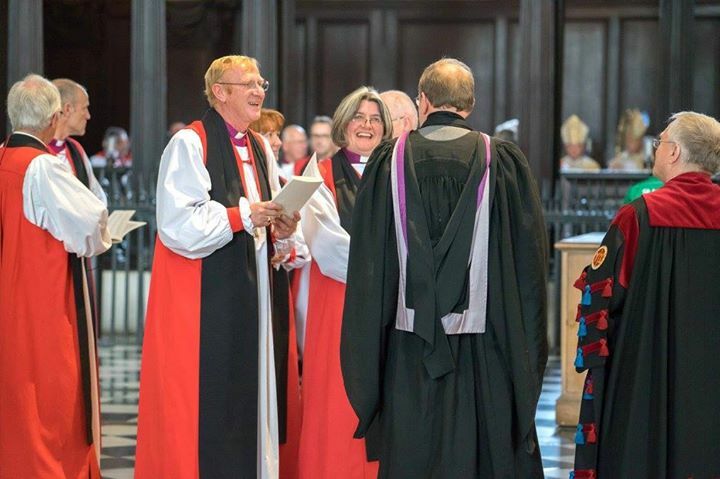 Certainly at the point of making declarations, and as the three candidates stood before Archbishop Justin, there seemed nothing odd or unusual about seeing Anne Hollinghurst and Ruth Worsley lined up with Ric Thorpe to acknowledge their calling. Except that… We had a protest. A gentleman dressed as a clergyman (in an old-fashioned stock and clerical collar) made his way to the centre of St Paul’s under the Dome and began to declaim his opposition. “Women Bishops are not in the Bible” he yelled, and named Ruth and Anne as evidence that the Church of England had deserted the truth. He carried a home-made placard saying much the same and quoting a reference in Genesis. 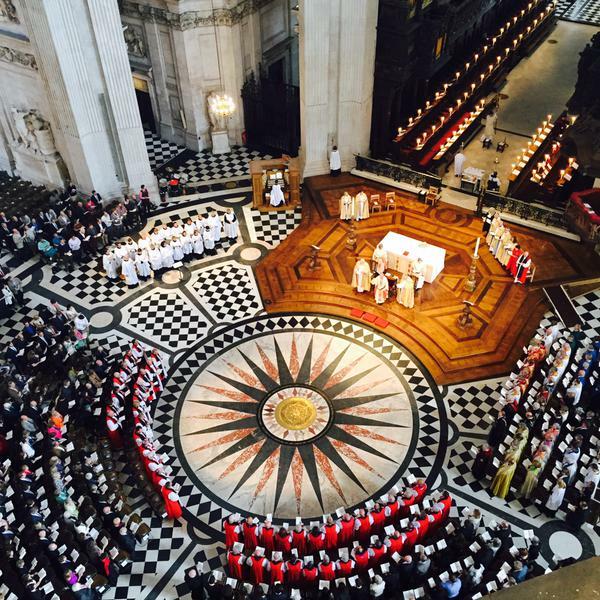 The spectacular setting for the consecration, seen from the Dome of St Paul’s. The protester (not seen in this image) plonked himself right in the middle on the star mosaic. And then Archbishop Justin ad-libbed a reminder of the facts: that the Church, after long discussion, had discerned that it was right for women to enter the episcopate, and that we would proceed. A large congregation under a very large dome. He asked for a moment of silence, but what he got was a burst of applause. And then the service carried on. When we were asked if it was our will that the candidates should be ordained, there was a resounding “IT IS!” that echoed for some seconds in that astonishing space that is the Nave. Afterwards, there was a lot of conversation about the protester as people dispersed or went on to celebratory gatherings. How did he get in and wander freely up to the centre of the service? One bishop with a very clear view told me that he had seen the man walking up the centre aisle and could see he was going to disrupt things – but no Cathedral staff apparently saw him. Why were the wandsmen to slow to respond? What would have happened if he had been malicious, armed or violent in some other way? I gather from informed sources that there was no expectation of a protest. At the January York consecration, a legal statement had been held in readiness, and was duly read out in response to the Revd Paul Williamson’s polite expression of dissent. At Canterbury in July , when Rachel Treweek and Sarah Mullaly were consecrated, a similar plan was in place – but was not needed. In retrospect, the lack of a prepared statement did not matter, as Archbishop Justin, everyone agreed, handled it beautifully. But the security lapse does matter. There must be some serious questions being asked about the level of security that were on offer at St Paul’s. Describing a consecration service is a bit like talking about a wedding to someone who wasn’t there – neither easy nor necessarily interesting. But there were some aspects worth noting. 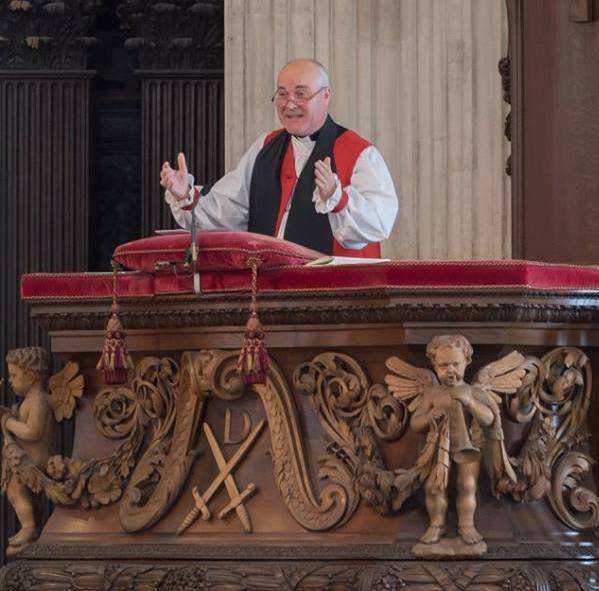 “Good Lord, deliver us from successful Bishops”: Bishop Stephen Cottrell preached in his usual ebullient style, and said some useful things about the nature of episcopal ministry. He made us laugh, he made us think. Hopefully, he will also have made us remember to pray for, challenge and support our Bishops. Great cathedrals often get moaned about because they seem unwelcoming and too conscious of their own importance. I have to report that St Paul’s was quite unlike that. I happen to know that beforehand, the office staff took great care to give really helpful support and information to those attending in wheelchairs – and their planned arrangements worked superbly. On the day, the welcome and efficiency of the volunteer staff was superb. A moving touch was the fact that one of the two candle-bearing acolytes leading the processions was a wheelchair user. In his power chair, and with a cut-down large candle, he whizzed round and was a special witness to ability, rather than disability. Well done St Paul’s! The new Bishops are presented to the congregation. 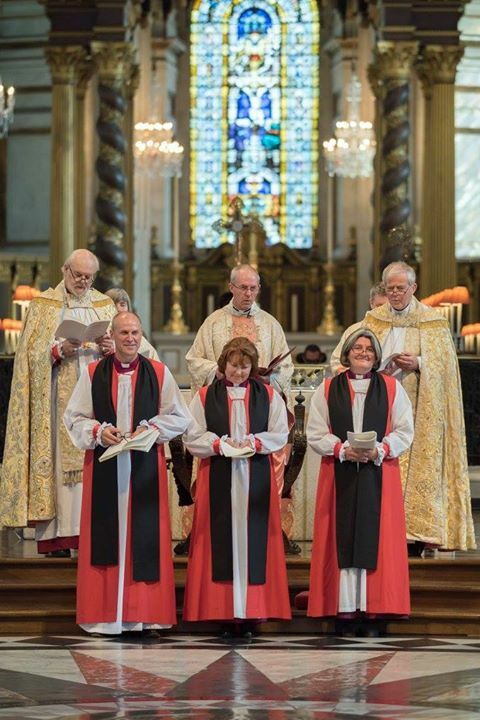 Anyway, it was a great day for Bath and Wells, Birmingham and London dioceses as they acquired their new Bishops. And the gender thing just seemed irrelevant. At last, it’s not unusual to have women at every level of ministry. *It’s not unusual – Tom Jones’ first Number 1 hit in 1965. This entry was posted in Slightly Synodical and tagged Church of England, House of Bishops, women Bishops. Bookmark the permalink. Delighted to hear it. I won’t tempt fate for Saturday here….